VICTORVILLE, Calif. /California Newswire/ — Desert Cities Dialysis needed to hire new employees; however all of its applicants were recent graduates who required extensive training. Manager Zabelle Cosson recognized that the County of San Bernardino's recruitment services and On-The-Job Training program could offset costs of finding and training the right people. 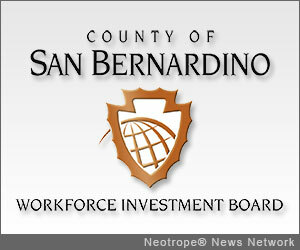 The County of San Bernardino Workforce Investment Board screened all applicants and referred the most qualified. The WIB's On-The-Job Training program provided partial wage reimbursement for the first 90 days of employment, the designated training period. Through these no-cost programs, Desert City Dialysis hired and trained two employees saving almost $7,000. Assistance from the County of San Bernardino WIB made it possible for Desert City to grow quickly and hire locally. "The Workforce Investment Board helped us find and train the right employees," shares Cosson. "Both employees are still with our company and are excelling in their positions." "On-the-Job Training helps relieve a business' growing pains by providing the resources to grow without the financial burden of recruitment and training," said Sandy Harmsen, Executive Director of the Workforce Investment Board. "The Workforce Investment Board's goal is to help create permanent jobs through these no-cost programs." "In one year, the Workforce Investment Board trained more than 3,300 job seekers for high-demand industries and built relationships with 2,800 businesses," stated Chair and Second District Supervisor, Janice Rutherford. "This work is critical to the continued growth of our local economy." Businesses interested in learning more about or enrolling in the no-cost services provided by the County of San Bernardino Workforce Investment Board can visit http://www.csb-win.org/ or call 1-800-451-JOBS. Employers and job seekers who are interested in the Workforce Investment Board programs may call: (800) 451-JOBS or visit www.csb-win.org . Also follow us on: Facebook www.facebook.com/SBWIB Twitter @InlandEmpireJob; and YouTube http://www.youtube.com/SBCountyWIB .